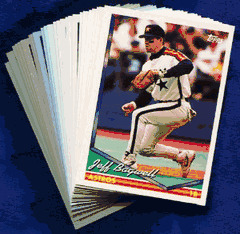 The 1994 Topps Houston Astros MLB Team Set contains 25 Houston Astros baseball cards including Star Players like Jeff Bagwell, Craig Biggio, Luis Gonzalez, Ken Caminiti, Darryl Kile and the rookie card of Billy Wagner. Collecting different years and brands of baseball cards from the same team can give you a different view of all your faviorte players. All cards in the set are listed below.